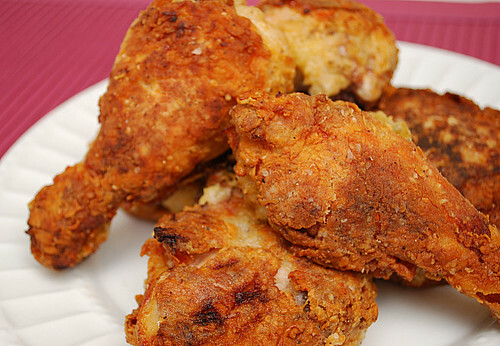 There are so many great fried chicken recipes out there and most involve similar steps. First you have to season the chicken, dip it in an egg wash or marinate it in a buttermilk bath, then dredge it in some flour before frying it up. I came across two good looking recipes and combined them in order to get the best of both wrapped into one recipe. The result is a super moist, flavorful and crispy chicken that's pretty spectacular! Place the chicken pieces in a large bowl and pour the buttermilk and hot sauce over them. Cover with plastic wrap and refrigerate overnight. Combine the flour, salt, pepper and garlic powder in a large bowl. Take the chicken out of the buttermilk and coat each piece thoroughly with the flour mixture. Pour the oil into a large heavy-bottomed stockpot to a depth of 1-inch and heat to 360 degrees F on a thermometer. Working in batches, carefully place several pieces of chicken in the oil and fry for about 3 minutes on each side until the coating is a light golden brown (it will continue to brown in the oven). Don't crowd the pieces. Remove the chicken from the oil and place each piece on a metal baking rack set on a sheet pan. Allow the oil to return to 360 degrees F before frying the next batch. When all the chicken is fried, bake for 30 to 40 minutes, until the chicken is no longer pink inside. Serve hot. I saw your photo on FoodGawker and it looks so delicious! This is going to be my dinner this week! Goodness! I made this for dinner last night and it turned out so beautifully that 2, count them 2! vegetarians decided to try some.